The Illinois Early Learning Project has created two convenient resources to help inform caregivers and parents about the Illinois Early Learning Guidelines. 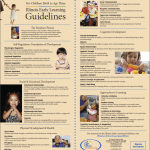 Our large (22.5” x 24.5”) poster lists all of the standards in the Guidelines. Our handy brochure, which also lists all the standards, can be handed out to parents and others interested in learning more about the Guidelines. IEL Guidelines Posters and Brochures are also available in Spanish. IEL will mail up to 10 posters and 20 brochures, in each language, free of charge to any address within the state of Illinois. The Illinois Early Learning Project will mail up to 10 posters and 20 brochures free of charge to any address within the state of Illinois. Paper copies of these posters and brochures may be sent only to residents within the state of Illinois. Those living outside the state of Illinois may print these posters or brochures from the IEL website. Enter the number of brochures or posters you would like shipped to you.